Plantinga’s argument in Not the Way I’ts Supposed to Be is that we know that something is off. We know that the world, while not unreal, is closer to a fun-house mirror than reality. As discussed last week, if this instinct is called conscience then the argument drives the definition of sin toward ethics. A solution to this is to label sin as part of our broken being, including the part that is the conscience, and call upon the conscience anyway. Another solution is to continue to seek something above the conscience. Everyone has the instinct that something is wrong because everyone has an ego and a drive to make the world as they wish. It’s not an especially Christian or even theistic argument- even assuredly economic-minded philosophers such as David Hume start their ethical framework with this instinct. Murdock writes, “Religion is the… love of that demand. Kant’s impersonal call of duty inspires respect, awe, fear, but not love.” (p. 146) A rule-bound religion is a disaster for faithfulness to God, for Shalom, and for a spiritually held understanding of sin. Every great religious revival has been a revolution away from a rule and toward conscience: the Episcopalians, the Lutherans, the Baptists, the Methodists. The Journal of John Woolman, Quaker is a fantastic testament to the kind of connection with God afforded by a religion that supports individual conscience. The best book I have ever read on how to maintain this kind of love doesn’t mention religion at all. 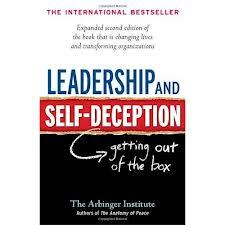 The book is Leadership and Self-Deception. It is written as an extended parable and at the point where the protagonist has a change of heart, he is mystified as to how it happened. The answer: “You questioned your virtue.” Or perhaps, you looked to something above your conscience as a route to God. This post by loafingcactus originally published on loafingcactus.com. We are reading one chapter per month, starting with chapter 1 in February. Read the kick-off post for this series. Endnote 20 references: A long work by Marilyn McCord Adams is referenced. Here is a 15 minute interview with her on Philosophy Bites. Dalfoerth references: Fischer, J., Anrede als Handlung. Skizze zu einer handlungstheoretischen Rekonstruktion der logischen Strucktur christlicher Ethik, theol. Diss. Tubingen (1982).